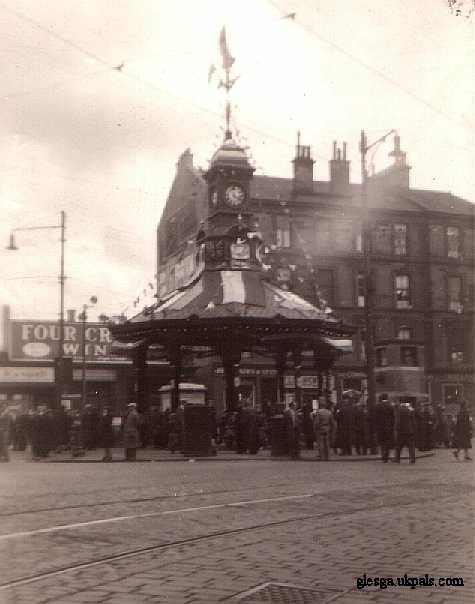 Bridgeton Cross's best known landmark is its 50ft high cast iron Umbrella, complete with clock tower, originally built to shelter the unemployed in 1875. 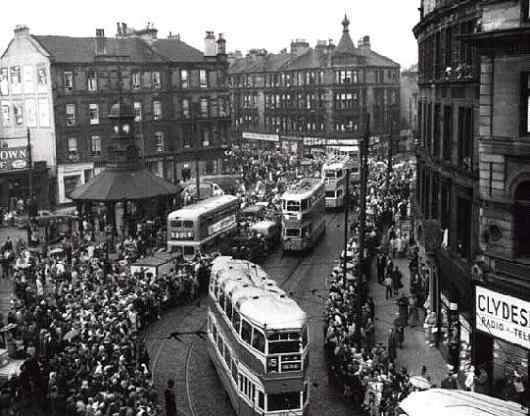 I remember the very busy mornings and evenings of the sixties and seventies sitting oan the bus at Dalmarnock Road heading tae the toon, THREE polis oan points duty. One at Dalmarnock Road/Main Street, another at London Road/Orr Street and the other at London Road/Olympia. 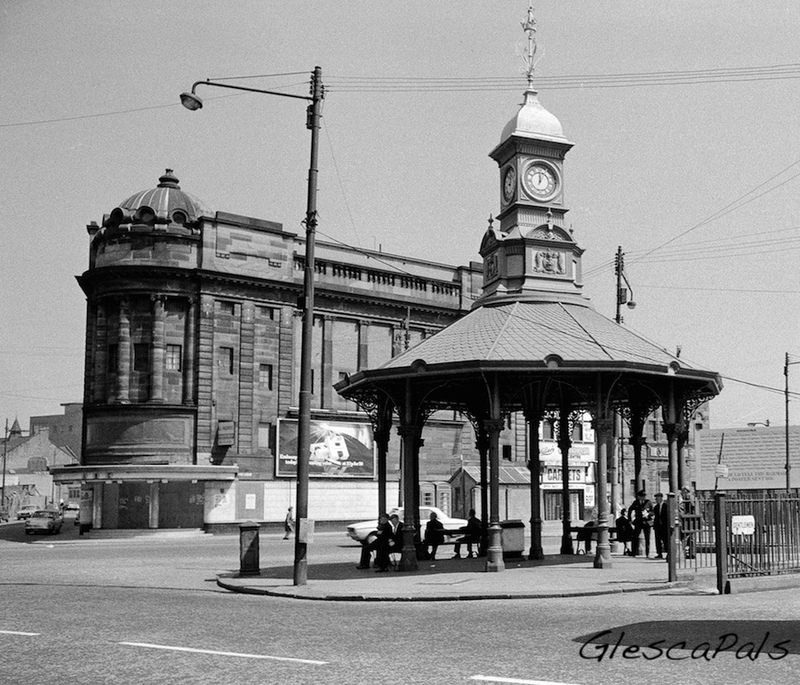 The open-sided shelter known locally as the “Umbrella” is one of the outstanding pieces of cast- iron construction in the city and a real Bridgeton icon. It was erected by George Smith and Co, “artistic iron founders” and produced at their Sun Foundry in 1874. The fluted cast-iron columns and delicate tracery supports a red tiled roof which is crowned by a four-sided cupola, bearing the arms of the City of Glasgow, with clock faces above and topped by an elaborate metal finial. The Umbrella was restored to its previous grandeur in 2010 by Clyde Gateway. This shelter was, apparently, erected to shelter the unemployed of the area and is one of the rarest and best quality examples of its type anywhere in the UK. For that reason it is listed at Category A. It is still a common local expression for someone to say that they are going "down to the Toll" when talking about Bridgeton Cross. This is an example of an earlier name persisting in common parlance, because Bridgeton Cross was indeed a Toll point earlier in its history. Before Bridgeton's foundation, the only route through the area was the road to Dalmarnock and its ford. As trade along the road developed and Bridgeton opened up a toll point was established across Dalmarnock Road, and later Main St, where these two roads met at the Camlachie Burn. There was a ford over the Burn here, and Barrowfield Bridge no doubt was built to facilitate crossing. Up until c.1870 the place was known as Barrowfield Toll. It was the slum clearance activities of the City Improvement Trust which led to the formation of Bridgeton Cross in the early 1870s. Many of the original buildings at the Toll were taken down and replaced by white ashlar tenements. The north end of the area was widened, and to add a finishing and distinctive touch, a 50 feet high cast iron pavilion was erected in 1875 in pride of place in the open centre space. This "Umbrella" as it came to be known, no doubt because of its appearance and the shelter it provided from rain, was made by the Sun Foundry.